Dominate the field with the Barska AR-X HQ 1x20 Red Dot Sight. 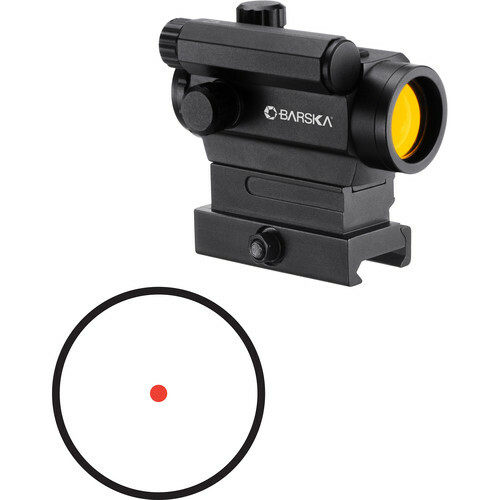 This 1x red dot sight provides a precise aiming reference point with its 1 MOA Red Dot illuminated reticle and can be instantly attached to your firearm using its quick release Picatinny/Weaver mount. The reticle's brightness can be manually adjusted using a built-in rubberized buttons or automatically controlled using the Auto Adjust Mode. To deliver clear and bright images, the optical system is also treated with full anti-reflective multi-coatings. Other optical advantages of this device are its wide field of view and an unlimited eye relief. To make corrections for trajectories, the scope also offers external windage and elevations turrets with 1 MOA clicks. To withstand harsh conditions, the housing is made from lightweight and durable aluminum and features waterproof and fogproof performance. The scope ships with a Picatinny/Weaver mount, one AAA battery, and two flip-up lens covers. To ensure slip-free operation, the turrets, lens caps, and adjustment rings are knurled.